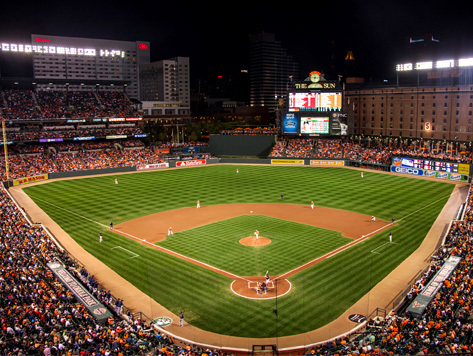 Whether you’re a fan of MLB’s Baltimore Orioles, or just a fan of Baltimore City, Oriole Park at Camden Yards is a must-see destination for locals and visitors. With its retro-design and modern amenities, Orioles Park has become a fan favorite since opening in 1992. Many cities have tried replicating its look and feel into their own ballparks. As visitors walk in, they are greeted by a large statue of Babe Ruth entitled “Babe’s Dream.” In the same courtyard, one will find sculptures indicating the retired jerseys of former players. Inside the stadium, much of the baseball field is dominated by views of the former B&O Warehouse and downtown Baltimore skyline. The ballpark is immediately adjacent to M&T Bank Stadium. Oriole Park at Camden Yards is a home run, with secure Baltimore parking garages within walking distance of Oriole Park. Book online ahead of time and save! Guarantee your spot for the next Orioles home game.